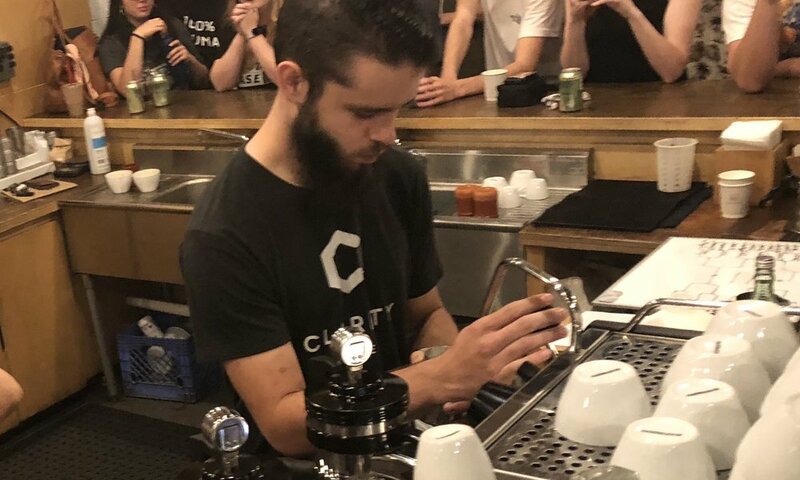 Last night, members of the Oklahoma coffee community came together for “Hearts for Hurricane Relief,” a Latte Art Throwdown presented by Green Country Throwdowns and Elemental Coffee to aid relief efforts in response to Hurricane Harvey. Caleb, Tanner, Callie, and Steve all participated, but the competition was fierce. Ultimately Ben from Topeca Coffee took home the gold. Congratulations, Ben! What is a Latte Art Throwdown? These events are a popular way for baristas all over the world to get together and show off one of the most easily recognizable skills in the coffee trade, latte art. While the rules change from event to event, typically two competitors face off by steaming and pouring a randomly selected basic latte design: a heart, tulip, or rosetta, into a randomly selected cup size: macchiato, cappuccino, or latte. Throwdowns are almost always an exciting and fun event for all and are a great chance for coffee fans, regulars, and friends to hang out and support your favorite barista! Generally, throwdowns are a lighthearted way for baristas to compete with each other and just hang out with friends, as compared to other more serious coffee events like the US or World Barista, Brewers, or Roasters Championships. We held a latte art throwdown last year. You can find a little recap of our event here. We were thrilled to be able to sponsor the event with prizes for the winner, and we’re thankful for all of our friends who helped make this event happen! Shout outs: Oklahoma Shirt Company, Green Country Throwdowns, Anthem Brewing Company, District House, KLLR Coffee, DNA Designs, Saint Anthony Industries, Barista Magazine, Handground and Chemex Coffeemaker.